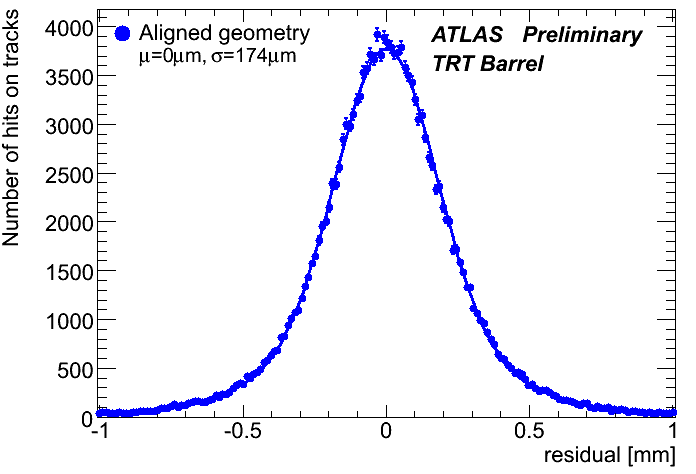 The TRT detector commissioning and performance plots below are approved to be shown by ATLAS speakers at conferences and similar events. Please do not add figures on your own. Contact the TRT project leader in case of questions and/or suggestions. 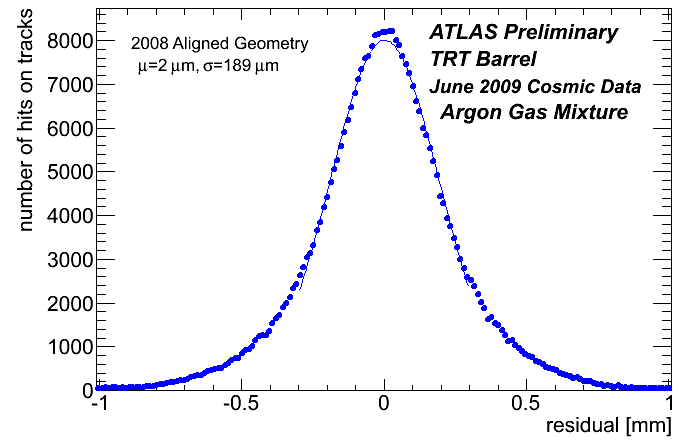 See also ATLAS approval procedure of plots based on cosmic-ray and single-beam data and ATLAS publication guide . Since rootlogon.C script for the later is meant for papers, an updated version of rootlogon.C is uploaded to this twiki page. Essentially the only changes made are larger axis titles and labels. Please use this one and check for updates. If a common script is adopted at ID or ATLAS level, we will update this one accordingly. For TRT SW, plots in preparation are shown here: Atlas.TRTPlotsInPreparationForApproval. Once approved, they will be shown on this page. Pictures - page in preparation. Transition radiation TR is produced when a charged particle crosses the boundaries of two materials with different dielectric constants. The probability (intensity) of producing TR photons is depending on gamma (E/m) of the particle. The effect starts at gamma factors above 1000, thus essentially only for electrons in the typical energy range, and it is thus mostly used for identifying electrons. In the TRT, TR photons are detected by absorption of the photons in the chamber gas (Xenon mixture, short absorption length for photons) leading to high electronic pulses crossing a high threshold (pulses from particles which do not produce TR usually do only cross a low threshold). 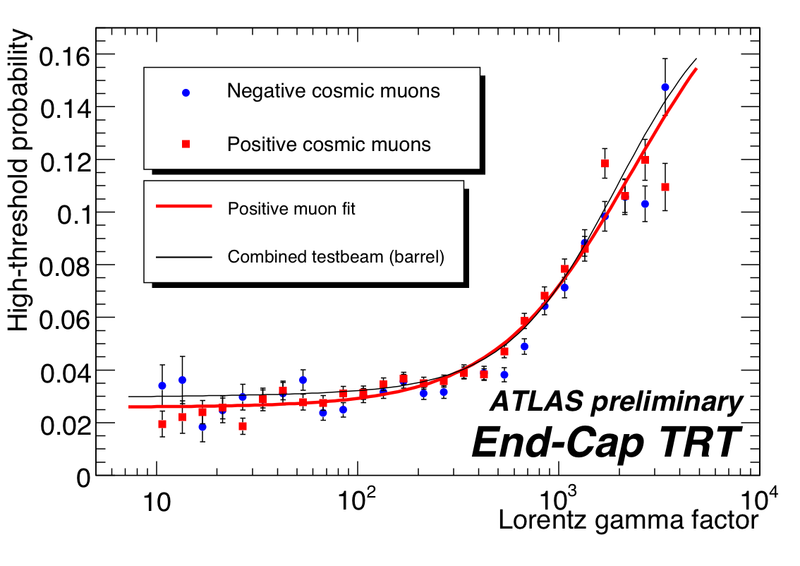 On the plot one can see the turn-on of the production of TR photons as a function of gamma as measured for the tracks of cosmic particles (Muons) during cosmic data taking of the ATLAS detector in October 2008. On the y-axis the probability of a high-threshold hit (indicator for TR) is given. 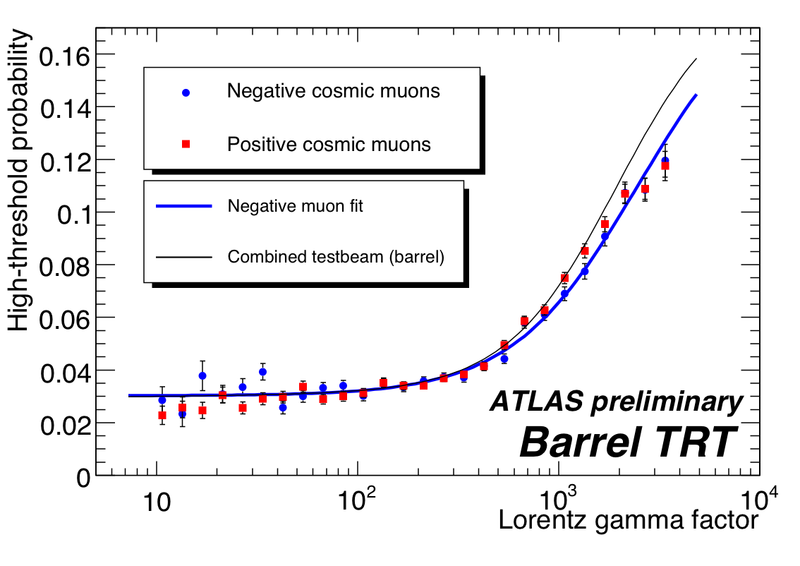 The data points are shown for both muon charges (positive: red dots, negative: blue dots) and are compared to the results obtained in the ATLAS Combined Test Beam in 2004 (black line). 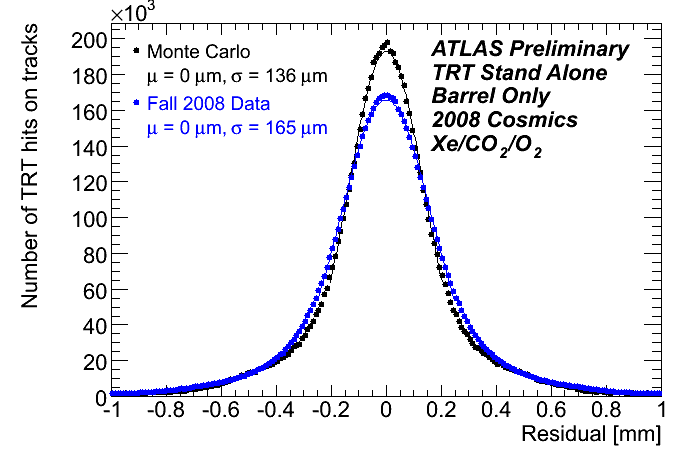 The blue line gives a fit to the results obtained with the cosmic data, see description (details) below. 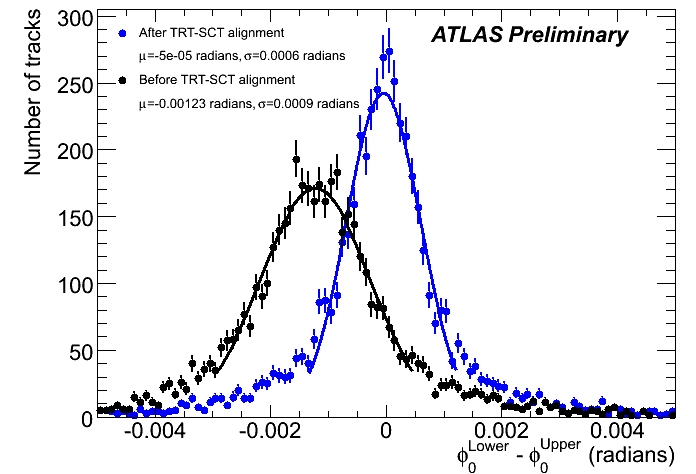 The turn-on of the Transition Radiation is nicely seen and the identical behaviour of the detector to cosmic tracks and data recorded at the test beam demonstrates that the TRT is working properly. The correspondence between mu+ and mu- is very good, and the results achieved with the barrel TRT and the endcap TRT also look much alike. Finally, the pT has to be in the range [0.5,1000.0] GeV (for end points). SCT hits are used to give the (th)eta of the track, and this requirement also greatly cleans up the sample. However, it reduces the 95000 tracks to 20000 (out of an original 140000). After this, the events are asigned to bins in momentum (logarithmically), charge, and theta, and the hits are divided into barrel and endcap, after which the HT probabilities are calculated (as simple ratios). In the fit, par is fixed to its expected value from CTB (about 0.16), since the cosmic data is not sensitive to the level of the high plateau, and out comes the two plots. 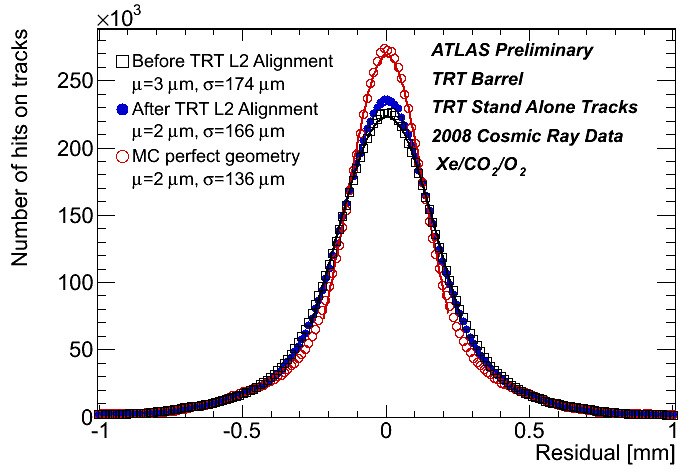 The same figure as above for the Barrel TRT, however the results here were achieved with the End-Caps of the detector. Concerning the production of transition radiation, the main difference between the Barrel and te End-Cap TRT are the different type of radiator materials. In the barrel, polypropylene-polyethylene fibre mats are used ("chaotic" orientation of fibres/boundaries) are used, in the end-caps polypropylene foils ("aligned" orientation of boundaries) serve as radiators. 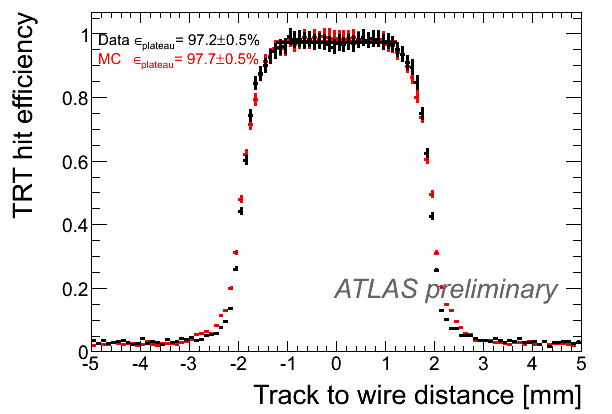 This picture shows one of the first cosmic tracks recorded in the barrel TRT with the ATLAS solenoid being on. Small blue crosses indicate individual straw tubes of the barrel detector which have seen a signal. Particle tracks are nicely visible, low momentum particles even curl within the detector volume, reminding of bubble chamber photos. 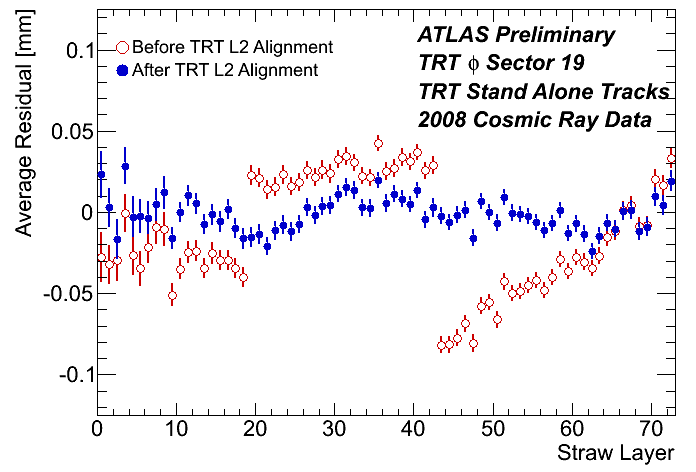 The event was taken in ATLAS Run 83585 and is displayed using a TRT monitoring tool, the TRTViewer. The fraction of straws giving a signal which is not on a particle track (noise) is adjusted by the setting of the low threshold to be about 1%. 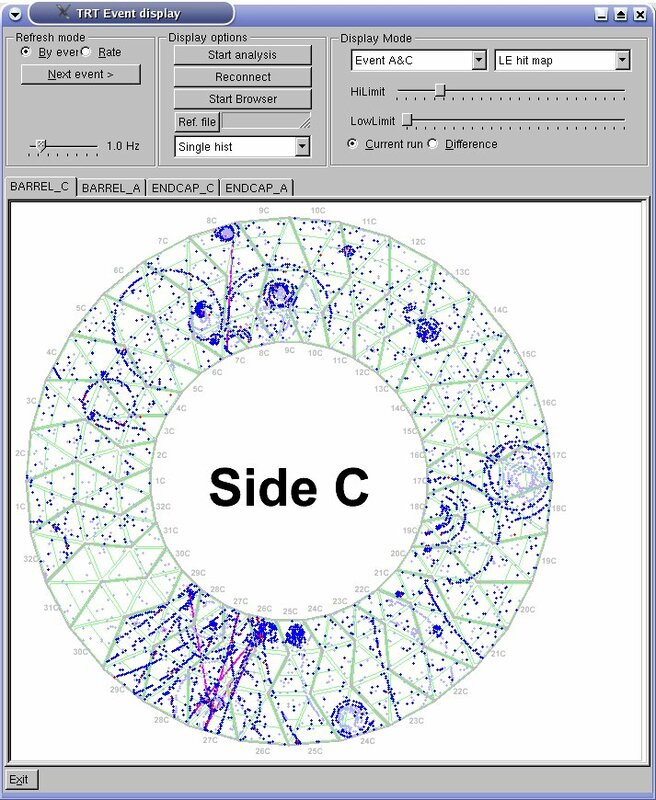 Similar figure as described above for the barrel TRT but this time for one of the two endcaps. On the x-axis the phi-sectors of the End-cap are given (32 in total), on the y-axis the different End-cap wheels are indicated (from bottom to top: 12 wheels of type A, short distance between detector layers, closer to the interaction point; 8 type B wheels with doubled distance between each layer of straws). The event was taken in ATLAS Run 83527 and is displayed using a TRT monitoring tool, the TRTViewer. In sectors 9/10 two curling tracks can be seen - an electron-positron pair from a conversion? This TRTviewer plot shows time over threshold (ToT), in ns (label % in the plot is wrong), for one of beam splash events, for TRT barrel side A. In beam splash events, there were many particles crossing each single straw. For that reason, leading edge signal (LE, coming from the electron that drifts for shortest distance) comes at the same time for all straws (assuming splash of particles is coming at the same time in different parts) and trailing edge is always invalid (TE, the signal continues outside the 3BC read-out window). Therefore, since ToT = TE - LE and TE is always 75ns, the plot effectively shows LE for different parts of barrel A. 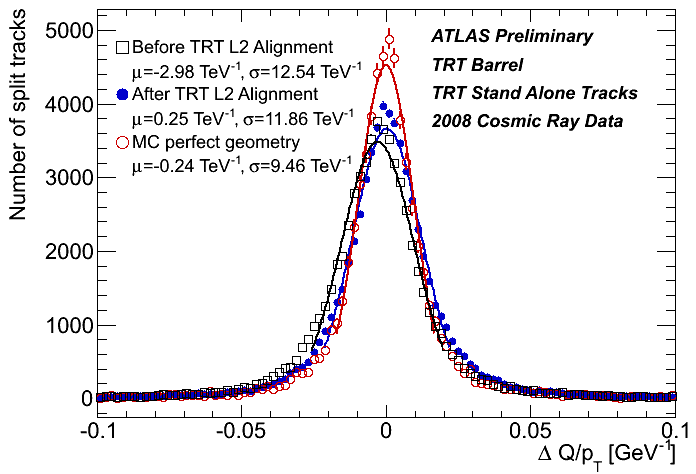 Since the tracks pass different parts of the detector at the same time, variances in the measured LE are actually only due to different signal propagation time (taken into account with T0 delay settings). 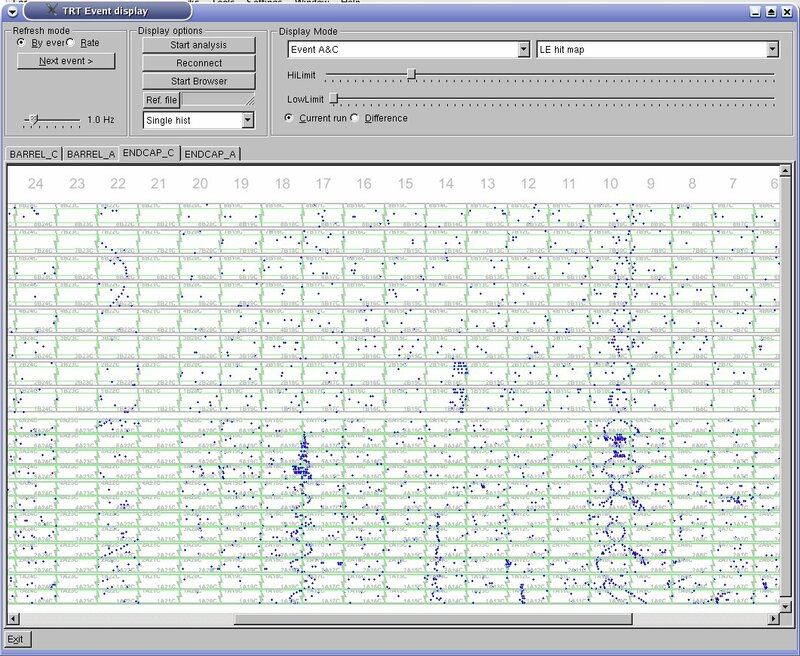 Systematic pattern from top left to bottom right is because we used cosmic data to determine our current T0 delay settings and we did not correct for the time of flight - the effect of which can therefore be seen in this plot. Aside from that, you can see that the pattern is very uniform, confirming good accuracy of our T0 settings. Therefore, only one global transformation (that takes into account different time of flight in collisions compared to cosmic data) is needed for running with collisions. This plot shows the TRT straw efficiency as a function of impact parameter of the track to the central wire. Precisely measured tracks (with silicon hits) have been propagated through the TRT volume. To the hits constituting the track, hits within a region of interest arround the track have been added in order to avoid tracking biases. The plot is then produced by taking the ratio of distances from a track to all hit straws to distance from the track to all straws in the region of interest. Before taking the ratio, the tracks are subject to a number of requirements as shown below, and non-functioning straws are removed. The exact same procecure is applied in data and MC. 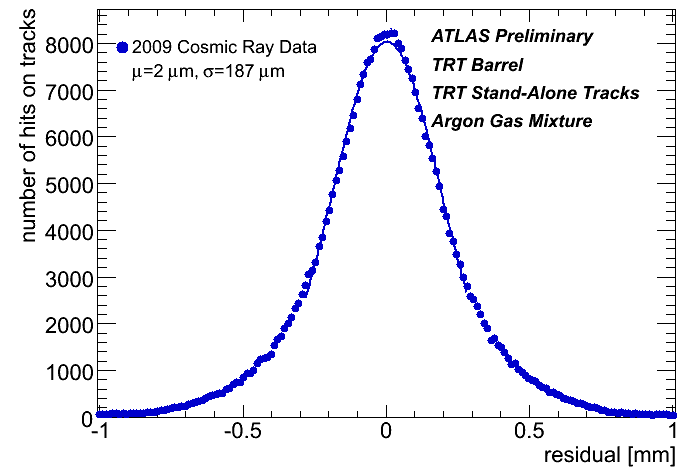 Figure: noise occupancy in the TRT (2008 cosmic data). 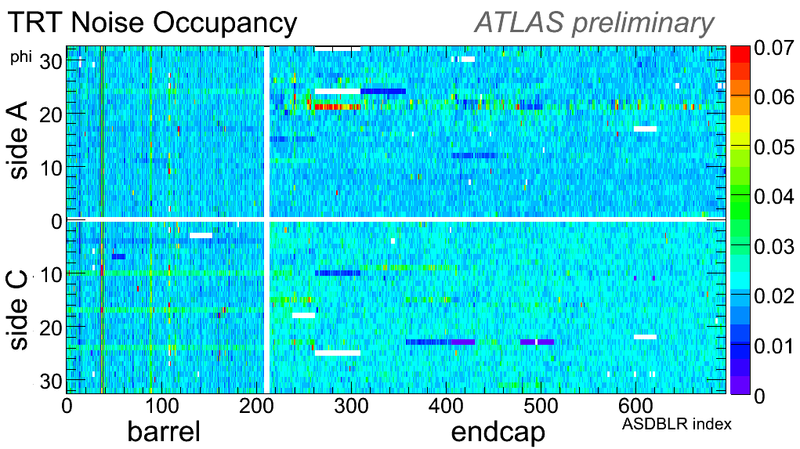 Description: this plot shows low threshold noise occupancy in 2008 cosmic data, run 96950. 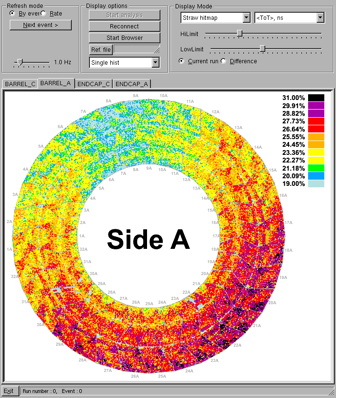 Straw noise occupancy shown in this figure is averaged over all straws in a given ASDBLR (analog shaper discriminator base line restorer, typically a group of 8 straws is attached to one ASDBLR). Permanently dead straws and straws with occupancy 100% were not used in the average. It can be observed that the noise occupancy is fairly uniform across the detector - confirming that the noise equalization procedure is performing well. Few phi sectors that have slightly higher noise occupancy (horizontal lines) were already adjusted for 2009 cosmic data taking. The fit is a single Gaussian, where the fit was iterated until the range corresponded to +/- 1.5*sigma. The mean and sigma of the fit are reported. The tracks are for five golden runs with magnetic field from Fall 2008 (runs 91885, 91888, 91890, 91891, 91900). The fit is a single Gaussian, where the fit was iterated until the range corresponded to +/- 1.5*sigma. The mean and sigma of the fit are reported. The tracks are for the run 121330 (run with magnetic field). The tracks are for one of the golden runs with magnetic field from Fall 2008 (runs 91900) and the plot show the residuals the strawlayers belonging to Phi Stack number 19. Note that we do not align each strawlayer separately, but only the modules (3 modules in the case of one stack). This is why the residuals after the alignment don't go to zero. The plot also shows why we do this. The misalignment of the strawlayers (red point) are not random, but there is a structure corresponding to misalignment of modules as a whole. In addition this plot shows that the precision of the barrel assembly (that can be inferred by the magnitude of the strawlayer residual before the alignment) is within 50um, better than the expected 100um usually quoted.